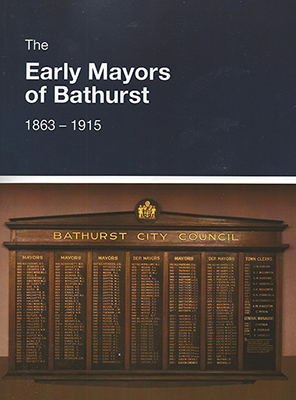 The Early Mayors of Bathurst 1863-1915 by Dianne Barnes was released at the Group’s 30th birthday celebrations in 2014. The book covers the period leading up to and during the early years of the establishment of Bathurst. The book is a facinating read, with readers exploring Bathurst’s early mayors through their personalities. The author has thoroughly researched the topic to write the book – a task that took around 14 months and involved scouring archives, newspaper collections and Trove. The book is both informative and enjoyable to read and own. This book will be reprinted with some updates during 2018. An eBook will also be available. For current pricing, please see our order form. Use our Order Form for convenience and payment by credit card or EFT. To purchase the book, please send your request with payment to Secretary, BFHG, PO Box 1058, Bathurst NSW 2795. Direct enquiries to our president.